I am finally writing a post about my trip to Croatia and Italy. I've been back for a little while, but there was a million things to do and now I finally feel things are getting back to normal. Let me tell you, it is not easy returning and picking up where you left off after being gone for two months! So what did I do, where did I go? Wow. I went to tons of places and saw many many dear people and boy did I eat. I am actually going to make this a three part post. Today I am going to show you some of my favorite things I had while staying in my hometown Zagreb, capital of Croatia. I will write separately about the coast of Croatia (Dalmatia) and our short two day trip to Italy (Venice). If you never tried these, look for a Bosnian/Croatian/Serbian deli or restaurant in your town and give it a go, they are really awesome! 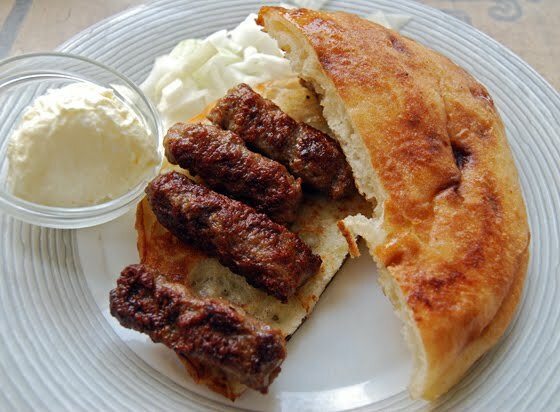 While I enjoyed my Ćevapi, my brother ate skewerd kabobs(Ražnjići) made with pork meat. They were delicious and so tender they almost melted in my mouth when I tried them. I was almost sorry I didn't order that. Almost. 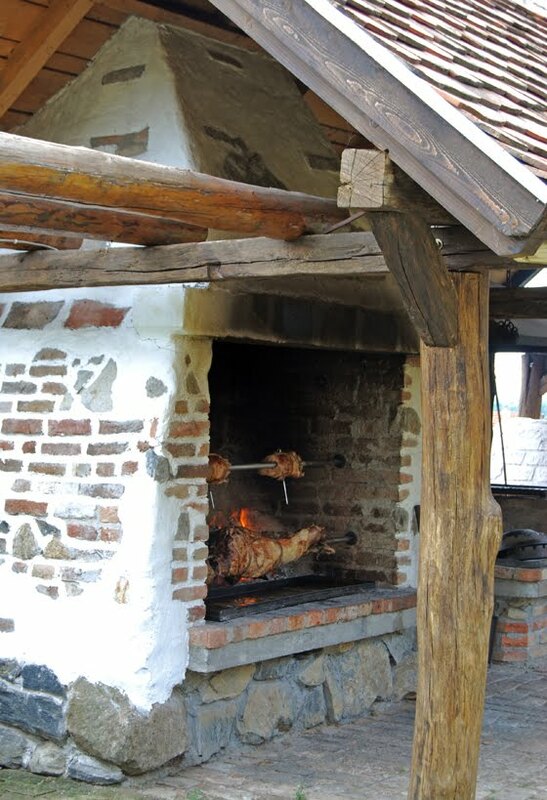 One of more memorable foodie experiences on my trip was definitely a trip to Kezele Family Farm near Zagreb. 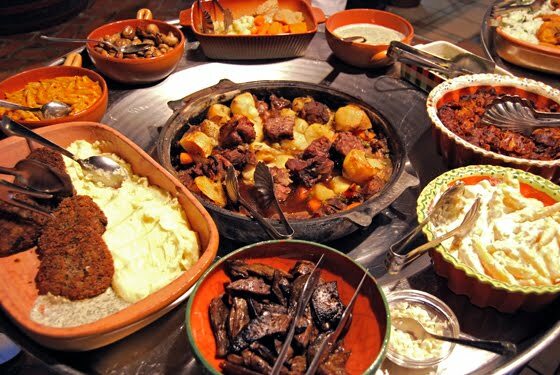 If you have an extra day in continental Croatia and you want an awesome food experience of all of our continental specialties, this is where you want to be! 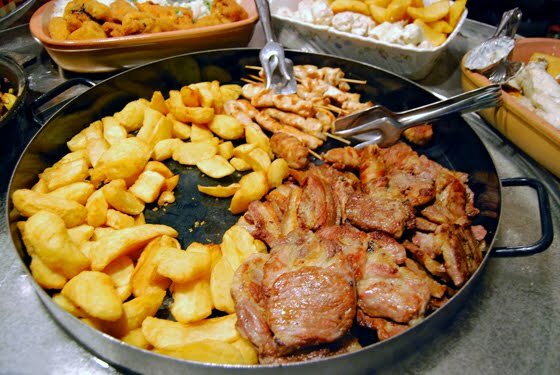 For less than $20 you get a full buffet style meal, but in a much more family type atmosphere than a buffet style eating would represent here in the US. 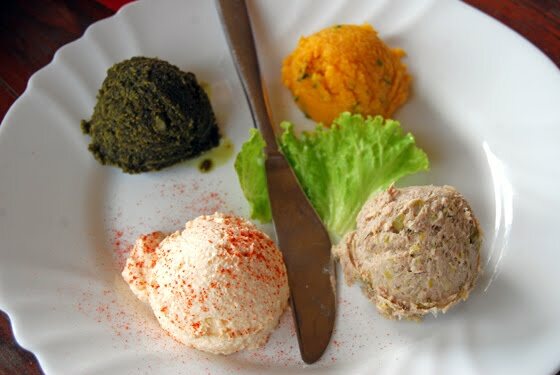 These were made from pumpkin seeds (green one), mixed veggies (red one), chicken (light brown one) and cottage cheese is the white one with red pepper sprinkled on top. These were yummy and helpful since the food is served at 1PM and we got there early! The meal begins with two soups, this time we got creamy vegetable soup and a very traditional clear beef soup with homemade noodles. 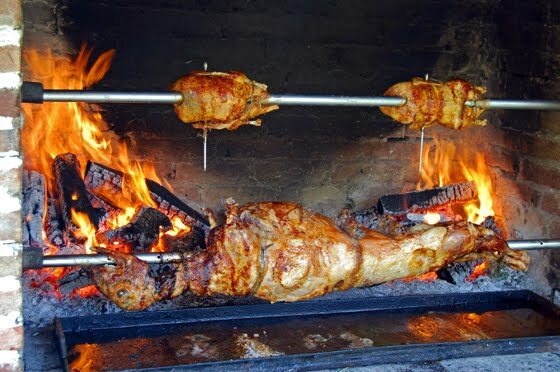 One of the most popular dishes here are made in a typical Croatian outdoor rotisserie grill. Lamb and young pork are the most common ones, but here they had lamb and turkey, and oh boy was it good! Anyway, meat prepared like this is so beautifully salty and crispy on the outside, and then fall of the bone juicy and tender on the inside. It is served with baked potato halves, fresh onions and homemade bread made in specialty Pizza like ovens. Picture underneath is of skewerd chicken kabobs and deliciously tender pork chops with baked fried potatoes. (I only tried potatoes but some of my friends tried the other and said it was delicious). Then comes another specialty. 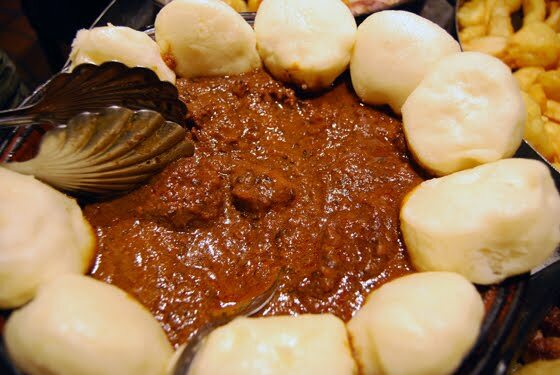 Wild boar stew with homemade bread dumplings. This is such a special dish, it has that beautiful gamey flavor, it is little bit sour, little bit sweet and the teeniest bit spicy. It falls apart in your mouth and I would have been happy eating just that my whole meal. But, there was lots of foods to try, so I had like three bites. I will go back for this next time I go home. I promised myself. Here is two more pictures of the buffet style tables, I will just list the foods from here that I remember, plus, there was a whole another table like this filled with salads like red and white cabbage slaw, potato and macaroni salads, bean and onion salad, beets, all the different lettuces, radicchio, cucumbers, peppers, tomatoes, shredded carrot with raisins salad etc. Divine. 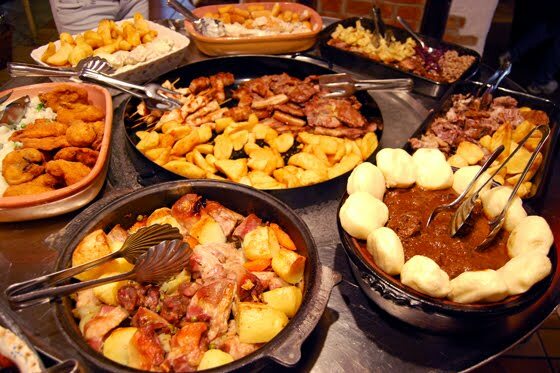 Rotisserie and country style roast turkey and half baked potatoes, fried chicken with rice with peas, croquettes and homemade white sausage with chicken, cevapi wrapped in bacon with cream sauce and homemade steak fries, different legumes and "Kropice sa zeljem" a very popular northern Croatian dish, better known as a popular Polish Haluski. Noodles with onions and cabbage. We have our own version and it is delicious. Also there is again rotisserie duck, wild boar stew and skewerd chicken and pork chops. On this picture above we have vegetarian patties with mashed potatoes, green beans, sauteed mushrooms, cooked beef with carrots (from the soup from beginning of the meal), horseradish sauce, baked beans, homemade noodles in cheese sauce and grilled liver (chopped garlic on the side). 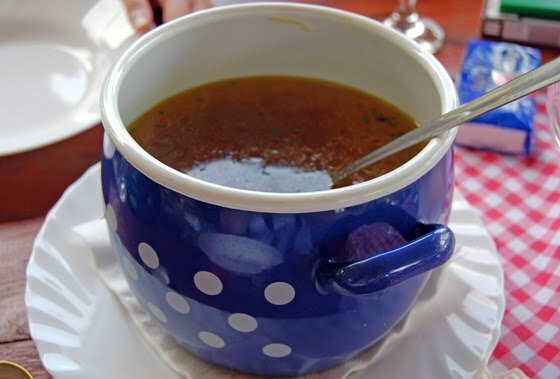 In the middle of the table is another specialty called Kotlovina, this one was specially nice with beautiful veal chunks. 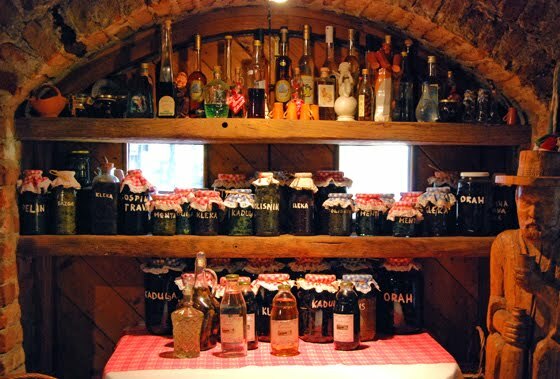 As a conclusion to this wonderful place, they also sell their homemade grappa made form everything you can imagine. Seriously. They have unicorn grappa. Well almost. They really do have a ton! Wow. I am getting quite depressed thinking back to all this delicious food, knowing I am not going to eat it for a few years. I am going to finish with a few super amateur shots of stuff my mommy cooked for me, my favorites I grew up on. Actually, maybe a too late apology, but I am sorry for a lot of these pictures...I think some are even cell phone pics! Oopsie. 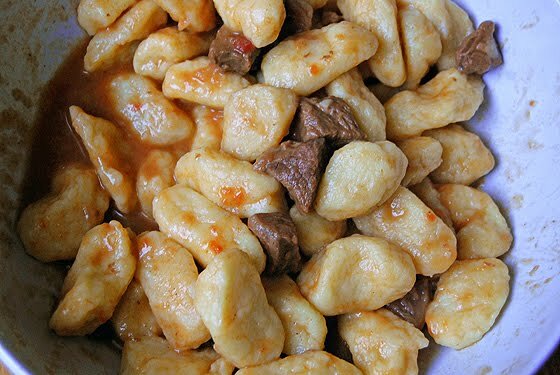 This is a pretty bad one of a yummy stewed meat with homemade potato gnocchi. My mom made the stewed meat and I made the gnocchi. It was quite wonderful and it disappeared within minutes. It is actually embarrassing how much gnocchi my family can eat. 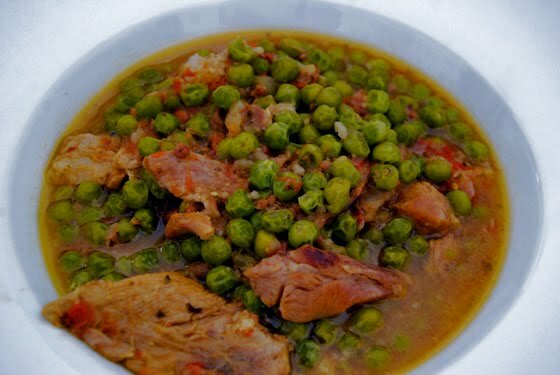 This next one was actually my birthday wish dish :))) as lamb is my favorite and it is soooo good home, this is a lamb and peas stew. Now this is a last meal kind of dish. I've made it with beef in US and it was ok, but with lamb...oh my gosh it is a cruise, a vacation, trip to the Moon and back. 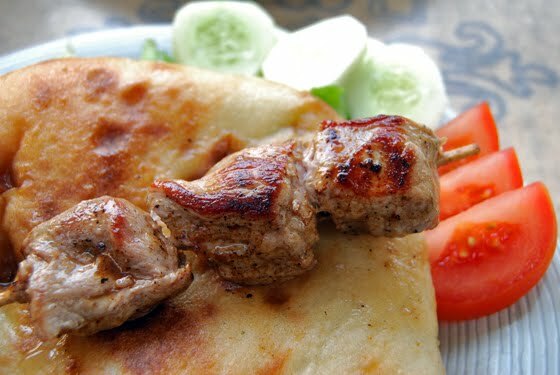 Such lovely but simple flavors, served with fresh crusty bread. Dip - Bite - Heaven. Now let me tell you about this next dish. 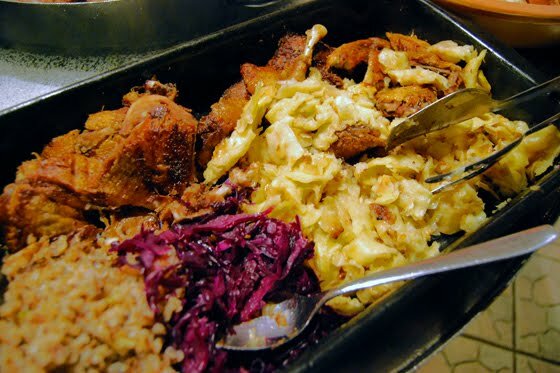 It is probably one of most often cooked, most loved or hated dishes in Croatia. Or at least this is the version of it. 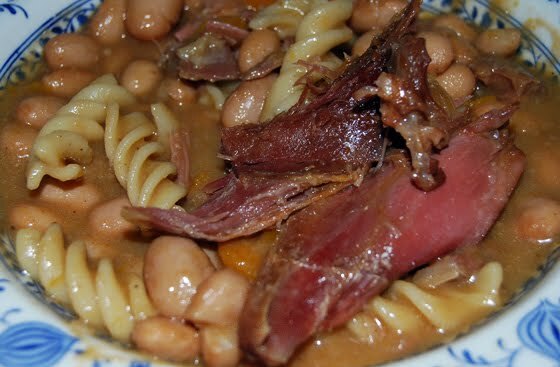 Bean stew. This is a version with pasta and I happen to love it. This was in my top 3 dishes this whole trip. It is always awesome, but what made it specially awesome is that my mom happened to have a prosciutto bone on hand (with some prosciutto still on it of course, as you can see in the picture). Boy, that bone took this dish from a pretty common everyday thing to a delicacy! We could not believe how good it was and even my dad ate it, and he never eats this dish! And last picture (finally, haha) is probably the worst one, cell phone and all, but it was so good and my mom made it for my birthday, my favorite thing ever, Tiramisu. I loved it! Everyone loved it. I have to try making my own mascarpone soon and then I will make it too. 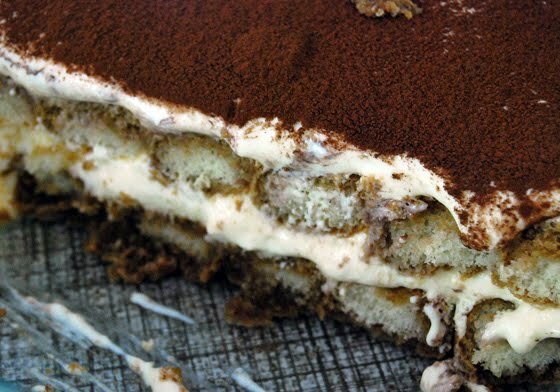 I already pinned mascarpone recipe! Your blog about Croatia Travel is really nice and this picture looks awesome . Thanks for sharing your experiences. I like croatian culture, food ,etc . I have visited last summer in Croatia and i have enjoyed very much. what was the restaurant called?